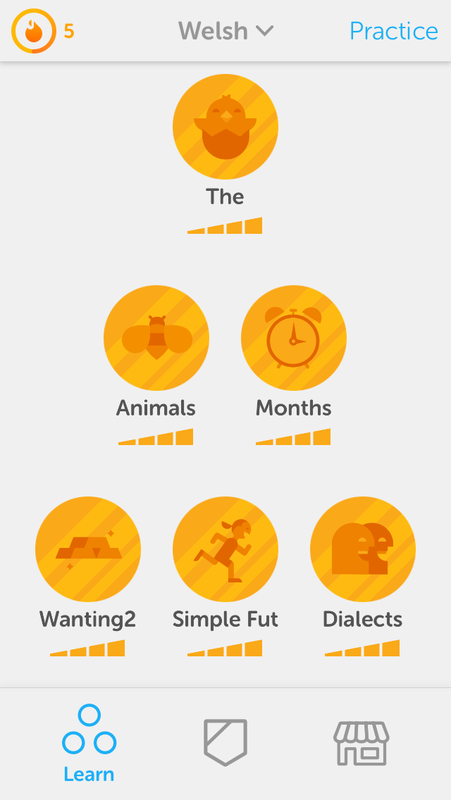 This week at times has felt like a race off with Duolingo on keeping all my coins gold! You see, once you’ve completed the group of lessons in a category, say animals, the coin turns gold. 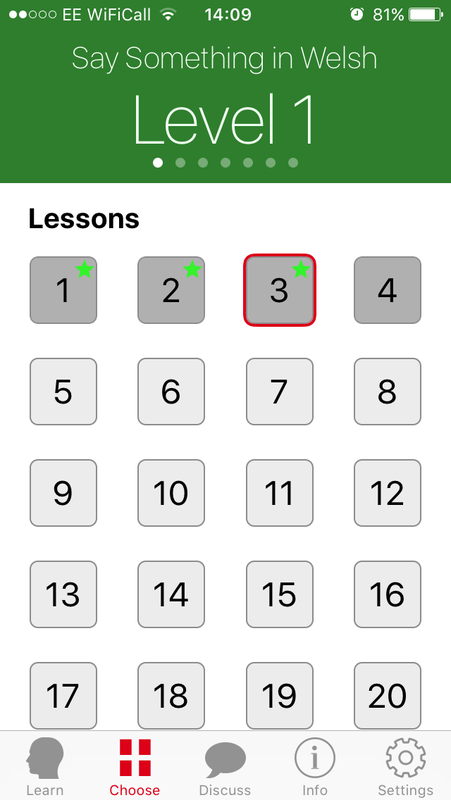 If you’ve made any mistakes the app remembers and then couple days later will show the lessons as incomplete encouraging you to recap on any weak words. It is clever. I mean who doesn’t like gold coins! But it has meant that It takes longer to progress as I have been recapping a lot this week and doing less new stuff. But it is deepening my learning and as the classic saying goes- it’s not the destination but the journey. This week on Duolingo I have enjoyed lessons on colours, weather and telling the time. I stormed the lessons on colours. I have endless games of the card game UNO to thank for that where ever since being with Hedd I have taken the opportunity to practice my Welsh colours. So that’s red (coch), yellow (melyn), green (gwyrdd), blue (glas) sorted! Added to that the types of wine I like, white (gwyn) and rose (pinc) and I was pretty set up for these lessons! This week I also completed lessons on weather. Absolutely vital vocab for us Brits- a staple in any polite conversation! I did alright on weather. Found it tricky remembering the bwrw when you want to say ‘ing’ e.g. Rain-ing / bwrw glaw. I enjoyed learning the time. My favourite is the Welsh for 12 noon and midnight…12 noon is “hanner dydd”, literally meaning ‘half the day’ and 12 midnight is “hanner nos” or half the night (does quite make sense but hey ho, it’s poetic!). I definitely had some latent embedded memory of the vocab which I took advantage of in those lessons…perhaps from being immersed in Welsh whilst staying with the Vaughan-Evans’ or sitting in the leaders office for a year whilst working at Denbighshire County Council. Who knows! But thanks memories- you helped me ace those lessons! SSIW challenge 3 I found much better. I was loads better at repeating the Welsh before Catrin started the speak (the aim of the game) and also managed to remember most of the stuff from lesson 1 and 2 that popped up again. Plus I didn’t feel so wiped out afterwards. Hmmm, I’m thinking doing SSIW may be a bit much in a midweek evening after work. Such a marked difference from doing challenge 2 on a Tuesday evening and challenge 3 on a Saturday lunchtime. But I would still like to do at least 2 audio classes a week…dilemma! 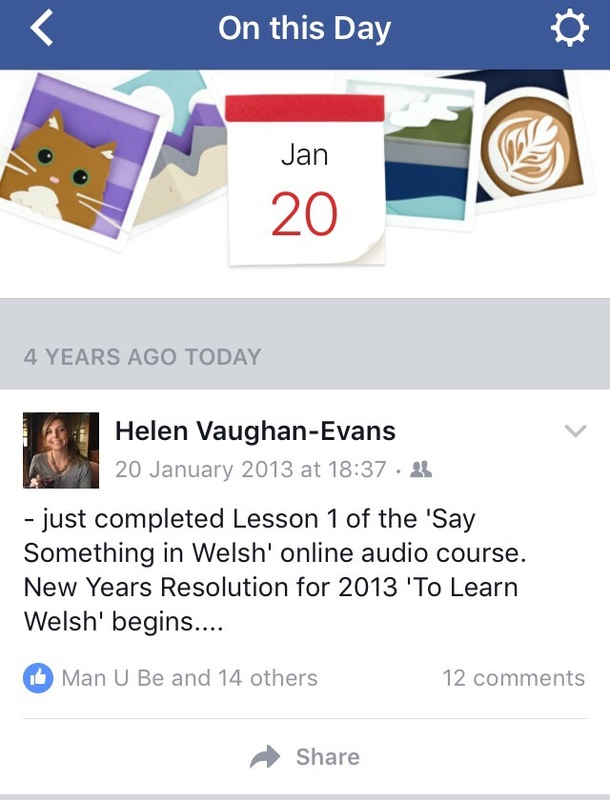 This week Facebook reminded me of my last attempt to learn Welsh, 4 years ago. I cracked a rye smile as I read the post, not dissimilar to my first post on this blog. I hope 4 years from now I won’t need to post something like that again and that I will be deepening and widening my grasp of the welsh language. That is my aim.